Sometimes there’s a perception that domestic violence is insoluble, because it’s such a complex, messy problem with women who are culprits as well as victims. Yet, in fact, this is an area where the United States has seen enormous progress. Based on victimization surveys, it seems that violence by men against their intimate partners has fallen by almost two-thirds since 1993. Attitudes have changed as well. In 1987, only half of Americans said that it was always wrong for a man to beat his wife with a belt or stick; a decade later, 86 percent said that it was always wrong. A generation ago, police didn’t typically get involved. “We would say, ‘don’t make us come back, or you’re both going to jail,’ ” recalled Capt. Leonard Dreyer of the DeKalb County Sheriff’s Office. In contrast, sheriff’s officers now routinely arrest the aggressor. American women are twice as likely to suffer domestic violence as breast cancer, and the abuse is particularly shattering because it comes from those we have loved. “He’s the only person I’ve ever loved,” Ta’Farian, 24, said of her husband, whom she met when she was an 18-year-old college student. He gradually became violent, she says, beating her, locking her up in a closet, and destroying property. Still, she says, it became too much, and she called 911. Police arrested him. But she says that the day before the trial, her husband called and threatened to kill her if she testified against him, so she says that out of a mix of fear and love she refused to repeat in court what had happened. Her husband was let off, and she was convicted of false reporting of a crime. I was still thinking about the Kristof column this morning when I read this front page story in this morning’s Boston Globe on women who buy and hold guns for men. …As law enforcement agencies and the administration of Mayor Martin J. Walsh ponder ways to get guns off the street, they are learning that targeting the men who historically have been the primary actors in violent crimes is not enough. They must also disrupt networks of women who buy and hold weapons for men to use. Debora Seifert, a special agent with the Bureau of Alcohol, Tobacco, Firearms and Explosives in Boston, said that she has worked on cases in which women bought firearms for boyfriends who are drug dealers. 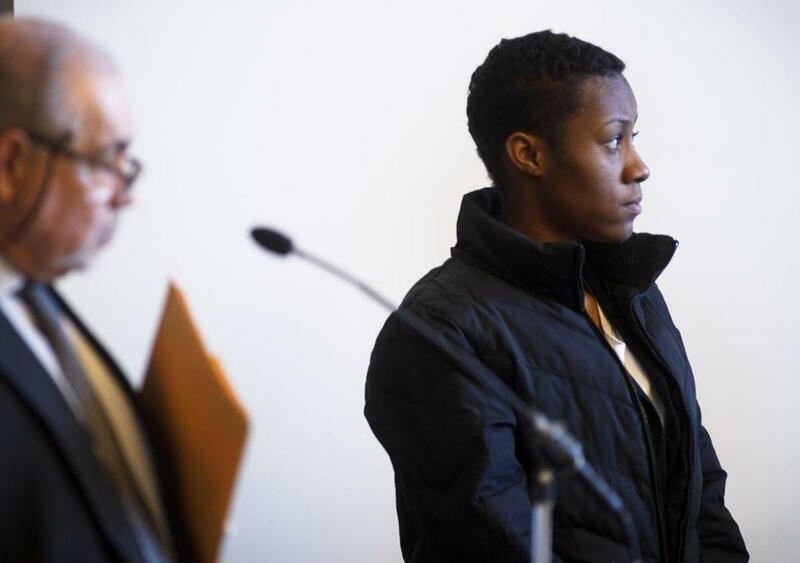 Police confiscated a shotgun and ammunition from Arianna Talbert’s Dorchester apartment last year. These guns are often hidden in apartments rented by the women and their discovery can result in eviction. While research is scant on women’s involvement in the gun problem, studies have been clear about who is leading violence by firearms, said David Hemenway, a professor of public health at Harvard School of Public Health. Men and teenage boys drive gun crime either as victims or perpetrators. If a woman buys a gun, Hemenway added, she is more likely to be buying it for someone who cannot legally buy a gun. “These young females find themselves facing jail time for holding that gun,’’ said Evans [Boston Police Commissioner William Evans] in a statement. The mindset that let Ta’Farian stay with her abusive husband is the same one that causes the young women to buy and hold guns. In the war on illegal guns, Ruth Rollins has heard it all. She’s an advocate for women whose own son was shot and killed. Women have long been flying under radar in police sweeps for illegal guns, she said. And women have become easy prey for criminally-minded men, who are becoming savvy in avoiding arrest for gun possession by having female relatives, partners, or juveniles hold firearms for them. Women have said they hold the guns for a variety of reasons: to get a few extra dollars, to get drugs, or simply to feel needed. The firearms are sometimes used as community guns stored in a central location, and anyone, from a wayward juvenile to a terrified young man, can have easy access to them. Kim Odom, who lost her 13-year-old son to violence, said some women feel a deep sense of commitment to their men, even the ones wrapped up in crime. Over past year and a half Rollins and Odom have been training and educating women about the consequences of buying and stashing weapons. They urge women to make pledges to not hold or buy guns and warn them of the penalties if caught. For instance, a person who makes a straw purchase faces up to 10 years in prison under federal law, US authorities said. Perhaps if we used some of the new technology that would prevent anyone but the gun purchaser from firing it, we would be able to cut down on some of the urban gun violence and some young women would be able to stay out of prison. Massachusetts Senator Edward Markey has proposed a Smart Gun bill. We should support it. This entry was posted in Culture, Politics, Public Policy, Women's Rights and tagged Boston, David Hemenway, Domestic violence, Ed Markey, Gun laws, Gun safety, Gun violence, Nicolas Kristof. Bookmark the permalink.